Hello everybody and welcome to a long overdue episode of Conversations with IrishPride. Today I am actually going to give a quick book review. That's right, an actual real life book. Well, technically, it was an electronic book on my Kindle app, but a book nonetheless! Believe it or not, I do read when I get the opportunity to. So without further ado, I give you my quick review of Ernest Cline's novel, Ready Player One. I've been in a slump lately, so I was looking for a new book to read to get my mind out of the real world. I looked around on Amazon to see if there was a book out there that would catch my attention. Naturally, I started in the Fantasy/Science Fiction section, since you know, I'm a geek. I was browsing through a few series, but decided I wanted a stand alone novel so I didn't have to worry about continuing a series. 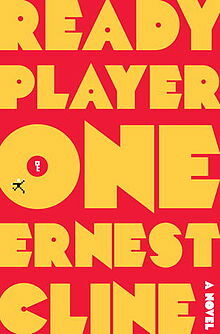 I came across a novel entitled, Ready Player One. I know you're not supposed to judge a book by its title, but the title is actually what got my attention. This book had to be video game related and I was not disappointed. I read some of the many 5 star customer reviews and was excited about giving this book a go. What sold the deal was this quote about the book by John Scalzi, New York Times bestselling author of Old Man's War: “A nerdgasm…imagine Dungeons and Dragons and an 80s video arcade made hot, sweet love, and their child was raised in Azeroth.” After reading that epic quote, I knew I wanted to read this novel. Ready Player One is set in the near future, 2044. It is a very depressing time to live on Earth due to famine and poverty running rampant and for citizens to escape the harsh realities, they turn to the OASIS. The OASIS in a virtually reality world that contains multiple locations and planets. Think of it like World of Warcraft, but much, much larger and you are the one actually controlling your avatar in a virtual world, not in front of a computer screen. The creator of the OASIS, James Halliday, has just recently passed away and having no successors to speak of, he decides to create a competition within the OASIS. Like in many video games we play now, you can find Easter Eggs and with this in mind, Halliday decides to hide an Easter Egg within the OASIS and gives all the players clues on how to find this Easter Egg. Whomever finds the Egg first will be the sole owner of the OASIS and will receive Halliday's vast fortune. The catch though is that James Halliday was absolutely obsessed with the 1980's. So, players inside the OASIS will have to have a vast knowledge on 1980's nostalgia; music, movies, television shows and of course video games. Without spoiling the story (no spoilers here!) players have to locate three keys within the OASIS and three gates to unlock. After unlocking a gate, a trial then has to be passed in order to move along in the competition. I'm not going to go into detail about anything else, because I don't want to accidentally spew something out that will ruin the book for potential readers. Let me end with saying that this book is for any geek, 1980's fan, or anybody who has played and enjoyed an MMO in their life. I thoroughly enjoyed this book; in fact I didn't want the story to end! I'm not exactly the fastest reader, but I tore through this book in four days; that just goes to show how much I enjoyed reading it. So, if you're tired of the current video game you are playing, definitely go check out Ready Player One. If you are a geek like me, you will not be disappointed. Since I've never done a book review on The Gameslave before, I'm not sure how to rate it, so I'm going to give it a rating of FFA! No, not Future Farmers of America, but FREAKING F*CKING AWESOME! That's right, in All Caps. This is IrishPride signing off. Until next time, do yourself a favor and read Ready Player One!